Over 2,000 years ago, Jesus sent his disciples out as missionaries to the ends of the earth telling them that: “the harvest is plenty, but laborers are few.” Today, His words are as urgent as they have ever been. The world desperately needs missionary evangelism and service. Two thirds of the over 7 billion people in the world today have never heard the Gospel of Jesus preached; that is to say that most of the world has yet to be invited into a saving relationship with Jesus! God is calling many people today to proclaim the Good News. Do you feel called to be a full time missionary? We hope and pray that if you do, you will respond generously to that call with your whole heart, with your whole life. Indeed, it is a great challenge, and those of us who have given our lives as missionaries know that there is no better life than one given completely in the service of the Gospel. All Catholic families and laity are called to the apostolate of evangelization and sanctification of our world today. There is exciting growth in the numbers of Catholic lay missionaries and families with children giving their lives to foreign mission. Please contact our office if you would like additional information; we would love the opportunity to talk and pray with you. Jesus is begging His Father to send laborers into the vineyard – the task is urgent, come with us into the fields! Each of us is called to holiness of life and we find our “rule” for life in the teachings of the New Testament. As missionaries, we are called to live God’s Word as Jesus did, to proclaim it boldly to others, to work it into the fabric of human society and culture, to extend God’s love to all, especially to the oppressed, suffering, and poor. We accept our daily crosses and redemptive sufferings, in poverty, humility, and a sometimes hidden life. We are a people of praise, thanksgiving, and rejoicing, truly happy to be among those send out by the Lord. We go forth to sow the seed of God’s Word, following the lead of the Holy Spirit, who is the principal agent of evangelization. We open our sails to the wind of the Spirit. As Catholic laity, we are formed by the teaching of our Church Magisterium, working in concert with her pastors. We seek to live in communion with God in personal and common prayer, enlightened by God’s Word, nourished by the Sacraments, living in community and service. Our worship is centered in the Eucharist. We frequent the sacrament of confession, receiving forgiveness and counsel. Our missionaries come from diverse places and backgrounds, they bring diverse perspectives, talents, and charisms. We are diverse and we are called to serve a diversity of people, all of us together living in unity with Jesus and the Father, in the Spirit. The fruitfulness of our lives as missionaries depends, in large measure, upon the prayers, material support and sacrifices of the entire people of God. We have seen and heard the cries of multitudes of God’s children awaiting the revelation of Jesus Christ – to be visited, taught, healed, delivered, forgiven, and shepherded by Him. Jesus is the one Way to the Father. We have seen that the poor are very open and happy to hear the Gospel, many reform their lives and follow Jesus. Yes, the harvest is great, but the laborers are few. God is calling many, many Catholic laity and families to become missionaries – just as He first sent forth the missionary family of Jesus, Mary, and Joseph to bring His Gospel into the world. PRAY! We encourage you to spend time in prayer seeking the Lord’s will, reading the Bible. Ask the Lord to really show you if He is calling you to missions. Read Go! You are Sent and Our Family’s Book of Acts, autobiographies by Genie Summers (co-founder with her husband, Frank, of FMC). Reading Genie’s books will provide you with an understanding of our history, spirituality, and approach to mission life. To purchase either these books please contact our office at office@fmcmissions.com or go to www.familymissionscompany.com/store. We encourage those discerning a missionary life to read the Book of Acts, which is the account of the Early Church’s missionary activity. We also recommend reading Mission of the Redeemer, Pope John Paul II’s encyclical on mission. He talks about the urgency of missions and the need for full-time missionaries in the world. Those desiring to discern their call to full-time missions with FMC are invited on a Come and See, a five-day retreat at our mission base. Come and See provides a taste of our way of life and an opportunity to meet and pray with our community. It serves as an orientation to missions with FMC before returning home to further discern if the Lord is calling them to serve with FMC. Come and See is a four-day visit to Big Woods, the mission base of Family Missions Company in Abbeville, Louisiana. During your Come and See, you will participate in the life of the FMC community and learn more about living as a full-time Catholic missionary with Family Missions Company. You will have an opportunity to meet and fellowship with the Directors of FMC and other FMC missionaries as you discern your potential missionary vocation. Children are most welcome! Each Come and See begins on the Wednesday night at 6:00pm with dinner and ends that Sunday at noon after Mass and community brunch. During Come and See, we pray, study and eat meals together as a community. We spend time in fellowship and participate in service and work projects. All of this will give you a glimpse into what life is like during Intake. You will also learn about the practical details of what it means to be a missionary with Family Missions Company and you’ll have the opportunity to ask questions about entering into full-time missionary life. The Come and See is meant to be one of the final steps in the Application Process to becoming a full-time missionary. During your Come and See, you will have an interview with an FMC missionary; spouses will interview with an FMC couple. This personal interview will address questions you may have about joining FMC and will help us to know you better. Again, this is as much a discernment for us, deciding if you (a single) or you and your family will be a fit as a full-time foreign missionary or missionary family with Family Missions Company. We highly recommend reaching out to FMC at least three weeks before the Come and See that you would like to attend. The Application Process contains several steps before arriving for the Come and See that we require for you to complete. The fee is $130 per single adult or $260 per family (includes spouse and all children), which covers housing and meals during your stay. For more information contact the Intake Team at intaketeam@familymissionscompany.com or by phone at 337-893-6111. Intake – 3 months of formation and training at our Big Woods mission base in Louisiana; This includes 3 weeks at our mission post in Mexico. The next 9-10 months of missionary life in a designated post outside the United States with a team of one or more other missionaries. Missionaries undergoing formation enter fully into FMC’s community life: living a simple life in humble accommodations, sharing meals in common, praying together and serving one another. Intake is a time of intense study, work, prayer and community life. During your first year, you will have monthly one on one sessions with an experienced missionary who will journey with you, pray with you, counsel and encourage you to grow into the missionary God is calling you to be. The missionary’s first official FMC Announcement Letter and mailing costs (ask about our family rates). What does a mission team look like? A mission team consists of at least two singles, or one family, who live and work together at a mission post. FMC will assign both your mission post and mission partner(s) at the end of Intake. Your mission team commits to work at a certain post and with their mission partner for at least one year. After your year of formation, you are free to discern other team possibilities. If I join FMC, where will I go? During your three months of Intake, you will be in constant communication with the Directors of FMC. Together you will pray and discern where God is calling you in mission, and you will be directed to your first year’s mission post. FMC receives requests for missionaries from all over the world, so every year different mission posts become available. After your first year in mission, you can choose to serve wherever there is availability. If you have a desire to serve in a particular country, FMC can help you to discern if God is calling you there, and help you to find a parish in which to serve. Does FMC offer health insurance to their missionaries? No we do not. However, healthcare costs in the third world are a fraction of costs here in the States. In addition, it is fairly inexpensive to purchase international health insurance if you desire, and many of our missionaries (children and pregnant women) qualify for Louisiana’s Medicaid program. How do full-time missionaries support themselves? FMC missionaries support themselves by writing letters to potential benefactors, speaking at their home churches, and other fundraising activities. Our missionaries live in poverty among the poor, and often our families live on less than $500 a month in missions, with singles requiring even less. If God has called you to missions, He will provide. We help you to compile a list of benefactors from among your family, friends, and broader community, and to draft a letter requesting funds. Most of our missionaries are easily able to raise the funds they need to stay in mission. What kind of people/qualifications does FMC desire in their aspiring missionaries? We are looking for people who are completely in love with Jesus, faithful to the teachings of the Church, and docile to the promptings of the Holy Spirit. There are no educational requirements, and singles must be at least 18 years old and one year out of high school. (Of course children are always welcome with their parents). Take a look at our FMC Charisms to see what kind of people we are. After the three month training period, FMC requires a two year commitment from its full time missionaries. We hope that many of our missionaries will embrace missions as a lifelong vocation! Can parents bring their children to Come & See? Intake? Missions? Yes, yes, and yes! Family Missions Company loves and encourages families with any number of children to become full-time missionaries. (We currently have a missionary family with ten kids.) Our programs and outreaches are designed to allow families to learn, grow, and serve together as mission teams. How do I become a full-time missionary? How do we become a full-time missionary family? If you are a Catholic single above 18 years of age, or a married couple, or family with children, Family Missions Company is excited to help you become a full-time missionary. The first step, after prayer and discernment has led you to consider mission work, is to contact the FMC office (337-893-6111 or missions@fmcmissions.com) and schedule a Come and See. 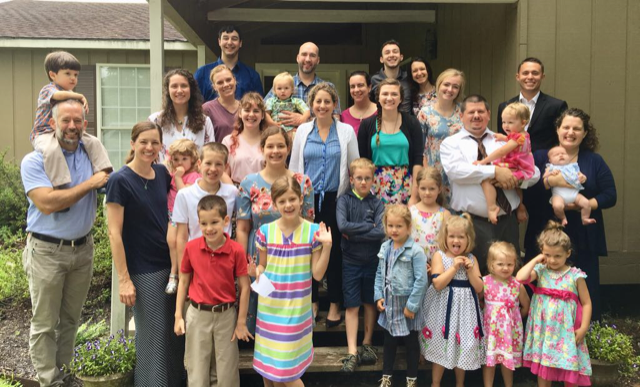 Come and See is a long weekend visit to the FMC base in Abbeville, Louisiana, where you participate in the life of the FMC community, and find out what being an FMC missionary is like. You will have an opportunity to meet with the Directors of FMC, and have all of your questions about becoming a full-time missionary answered.